The weight of expectation can be a terrible thing for games like Hyper Light Drifter that channel much-loved experiences from the past so directly. And whilst everyone I know (and every publication I read) is telling me that Hyper Light Drifter is the best thing since sliced bread, I feel like it falls a little short of what I was hoping it would be, even though it is far from bad. Heavily inspired by The Legend of Zelda: A Link to the Past and other lesser-known action RPGs of the same era, Hyper Light Drifter is an action-RPG that plays from a slightly angled, top-down perspective. Once the brief introductory section is over, players are more or less free to roam wherever they like, which is a relatively modern concept for this kind of game. A level of difficulty that starts high and rises to insane levels on occasion can bring progress to a halt, but it also makes Hyper Light Drifter feel incredibly rewarding when you succeed at it. 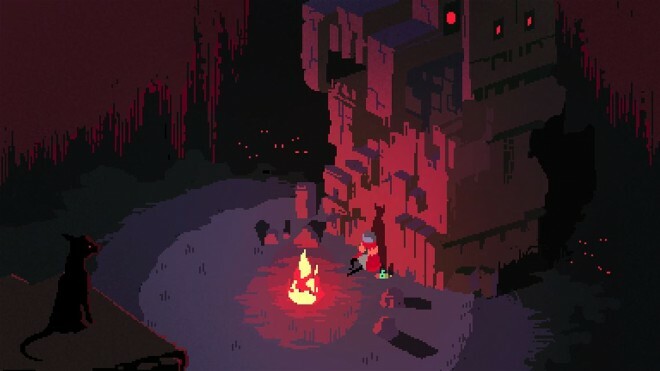 Top marks for style – What’s undoubtedly special about Hyper Light Drifter is its beautifully animated and incredibly striking art style and haunting, note-perfect soundtrack. The tale this game tells is open to interpretation and completely lacking in text or voice acting, but the stylish cinematics share a singular vision with the in-game action, presenting a hero wracked by disease and a dystopian world filled with oppressive titans and swathes of twisted denizens. The animation is beautiful throughout, and the game has a real fluidity that underpins the combat mechanics nicely. 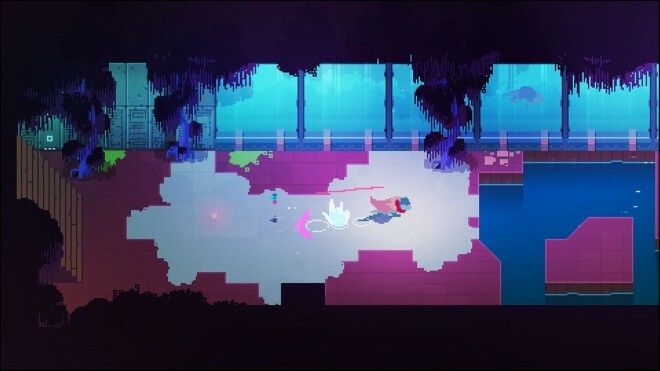 Fluent in the fighting arts – On the subject of combat, Hyper Light Drifter presents a relatively simple set of mechanics: sword slashes, a dash move and a blaster attack that serves as a ranged attack. There are subtle upgrades available later, but they are more evolutionary than revolutionary. What I found enjoyable about Hyper Light Drifter was how versatile the basic move set becomes, and how rewarding it is to use in the right way. Fighting becomes an art form as the easy, single creature encounters of the early game ease the player into more challenging encounters that feature multiple enemies in hazardous arenas. Hopping and slashing around the screen becomes a beautiful dance that is easy to learn but difficult to master. A world of promise – Hyper Light Drifter’s world is rather special. Aside from the beautiful art style and the subtle, pastel colour palette that delivers a very particular mood, there is also the mechanical element to consider. Firstly, it’s fairly vast, lasting perhaps eight to 10 hours for the average gamer, and it’s absolutely filled with secrets. There is something in this world for everyone, from completionists who will want to capture every secret, to those who are more interested in the visual cues providing additional lore. For those focused on the combat and simply wanting to reach the end of the game, that’s OK too, as sticking to the beaten path is generally straightforward. Souls survivor – Despite the obvious visual and story references it makes to The Legend of Zelda: A Link to the Past, Hyper Light Drifter is much more closely aligned to the spirit of the Souls series of games. 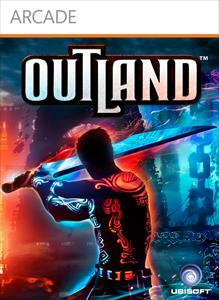 The game world is highly individual, and the storyline is inferred but never directly spoken. The combat is easy to figure out, but it requires genuine skill to excel at. And it feels all the more rewarding as a result. Sure, Hyper Light Drifter is a much simpler game than the Souls series, but it goes as far as a 16-bit throwback realistically could. Ambiguous – The downside of trying to recreate a minimalist story in a 16-bit art style and without any text is that it’s virtually impossible for players to work out the deeper meaning – if indeed there is one. Hyper Light Drifter therefore somewhat underwhelmed me, because I simply don’t think I understood it. This was compounded by the ending, which is wholly unsatisfactory. 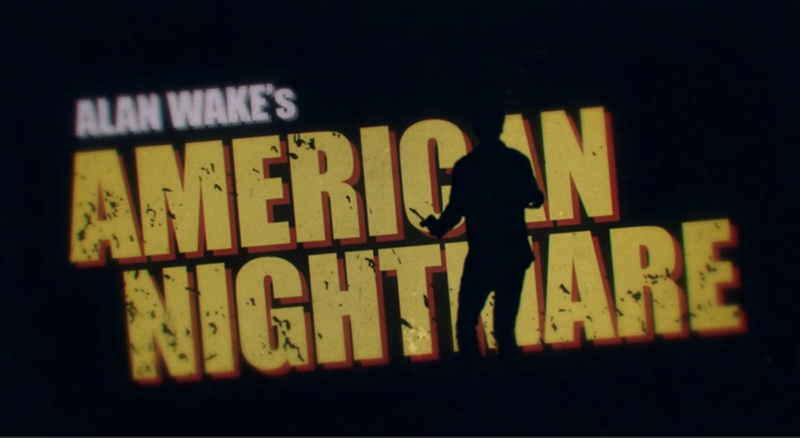 That being said, I have no doubt that for every person who has a brain that works like mine, there will be at least one other who thinks the opposite and can glean deep and meaningful moments of genius from the beautiful, understated cut-scenes and on-rails gameplay sequences. Really, really hard – A stiff challenge is more often than not welcome, but in the case of Hyper Light Drifter, things can go a bit too far. The open nature of the game allows players to quickly run into trouble, and the lack of clear direction can lead to areas full of frustrating, seemingly overpowered bad guys. Unfortunately, even when you return to some of these areas later, things will have only improved if you’ve honed your skills. In effect, this is one of those games that may present some players with a challenge that they will never be able to overcome. A couple of technical hitches relate to this point, because the combat is so tough and exacting and requires much fluidity. The former issue relates to gunplay, which I found a touch too sensitive and unforgiving when trying to aim, and the latter is stems from slowdown. 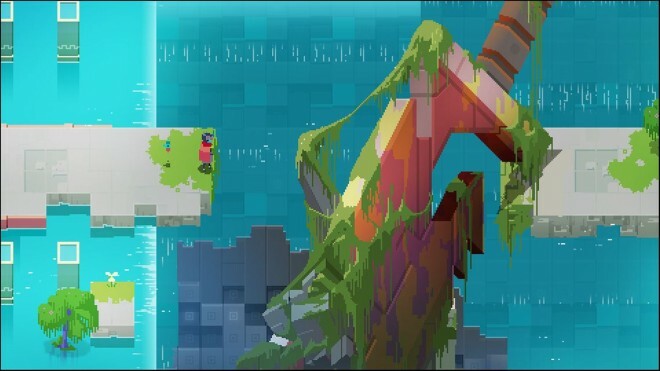 When the framerate occasionally drops – which is rare, but not so infrequent that you won’t notice – you’re likely to mistime the dash manoeuvre that is so key to survival in Hyper Light Drifter. That might not sound like much, but it can have the magnitude of killing you during a boss fight that you’ve spent 10 or 15 minutes on only to be thrown right back to the start. Considering how I opened up this review, you’ll probably be surprised to have my thoughts to be broadly positive. That’s because of the weight of expectation. After waiting for Hyper Light Drifter for what seemed like an eternity, and reading countless articles about how fantastic it was, I couldn’t help but get carried away. I thought it was genuinely going to be the answer to all my gaming prayers when actually, it’s just very, very good. It doesn’t seek to do everything; it just presents an amazing, frustrating and beautifully crafted world. It supports it with (mostly) fluid controls and a combat system that is (usually) sublime. It presents us with a unique and intriguing narrative set in an environment that is completely alien, yet it leaves out the narrator. It is incredibly well-realised, but at times a little flawed, and there are lots of reasons to go and buy it. Just don’t expect way too much, and you might be pleasantly rewarded. 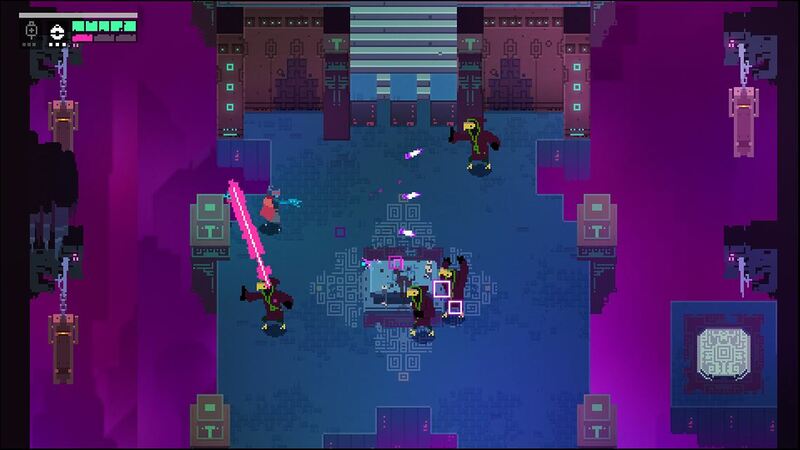 Hyper Light Drifter was developed and published for Xbox One by Heart Machine. It was released July 26, 2016 for $19.99. A copy was provided by Heart Machine for review purposes.